Breakfast: Kellogg’s Corn Flakes, Baked Apples, Whole Wheat Gem. I figured there was no more appropriate way to end my week of Kellogg’s food than with a bowl brimming full of Corn Flakes. Kellogg and his brother, W.K. 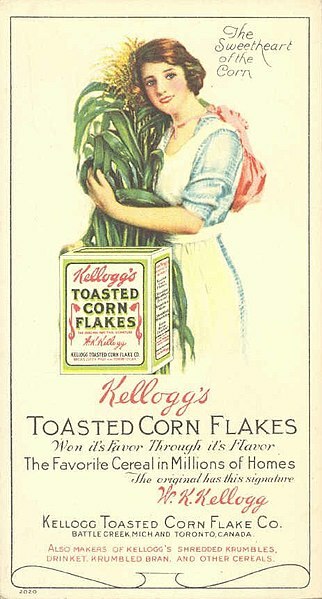 Kellogg, are the ones who the invented the technique for crisping rice and corn into Breakfast cereal, and thereby creating a whole new industry. I pared and cored two apples and then, because I wasn’t paying careful attention to the directions, sliced them up as well. They should be baked whole. I put the slices in a baking dish and squeezed a little lemon over top. I used brown sugar in my syrup. I baked the apples at 450 for about 30 minutes, let them cool, then scooped them out into a bowl. I drizzled them with cream and ate them up, although I think this dish could have been greatly improved with a pat of butter and a sprinkle of cinnamon. Dinner: Corn Roast and Baked Sweet Potato. Unfortunately, I didn’t get to have lunch today. I out and about in the middle of the day and well, it just didn’t happen. So I had an early dinner instead. The corn roast was quite good, I would say the best dinner entree I’ve had all week. I halved this recipe and used frozen corn; it was moist and tender when it came out of the oven, so I decided not to serve it with a sauce. 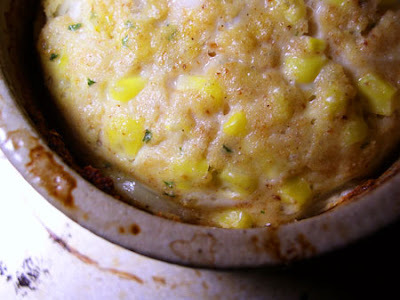 It was similar to corn pudding, and I easily devoured the whole dish. However, I don’t think I’ll be serving it at my final dinner party: although i liked this dish the best, Rice a la Carolina was the most interesting, and the most appropriate to the time period. The baked sweet potato was also an A+. Corn Roast. It looked exactly the same several hours later.